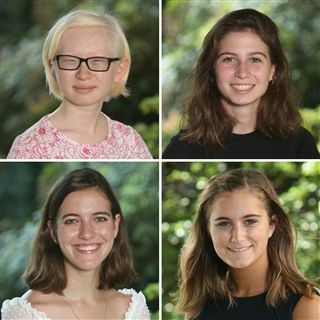 Four NCS seniors have been named 2019 National Merit Finalists, signaling their distinguished performance and high potential for future academic accomplishment. Katie Klingler '19, Nicole Owens '19, Olivia Vella '19, and Maggie Wang '19 were chosen for the honor based on test scores, academic records, recommendations, and essays. They will now be considered for National Merit Scholarships, which will be announced this spring. They are among the 15,000 students nationwide to be named National Merit Finalists. The National Merit Scholarship Corporation anticipates awarding approximately 7,500 scholarships this year. Congratulations to these 1e9endary seniors! This year's National Merit Finalists: Clockwise from top left, Maggie Wang, Olivia Vella, Nicole Owens, and Katie Klingler.